Jacques Cheminade, a presidential candidate in France, gave the keynote address for Panel II. The trans-Atlantic financial system in which we are living—based on appropriating money—leads to chaos or war, or more precisely and more tragically, to a combination of both. The preceding speakers have shown that the current world is more dangerous than it ever was at the height of the Cold War. The system, by its very nature, is criminal. Justice has become a cash-convertible commodity while fraudsters operate in packs, committing frauds with systemic effects which have turned our stock markets into gigantic crime scenes. Too big to fail, too big to manage, too big to jail: an industry of unpunished corruption has become the norm and the heads of our central banks have become counterfeiters. The mere fines that financial criminals are hit with give them in effect the right to perpetuate their fraud and trafficking, while the fines are paid with the bank’s reserves, to the detriment of employees, depositors and even shareholders. Today, these megabanks bluntly admit, as JPMorgan Chase did in its analysis published on May 28, 2013, “The Euro Area Adjustment: About Halfway There”: their intention is to dissolve democratic systems in order to enforce increasingly ferocious austerity measures on people. Lyndon LaRouche’s forecast, made back in the 1970s, of would happen, is now being echoed, after it did happen, by all those who are preoccupied with the future of mankind, as the criminals operate in broad daylight while fictitious capital comprised of debts and financial securities is growing, at the expense of the creation of wealth in the real economy. However, contrary to analysts that enjoy doom and gloom or practice selective indignation, LaRouche, from the start, reacted against this state of affairs by outlining alternative policies. He didn’t just denounce policies that were becoming increasingly intolerable and leading to war by their inner logic of looting and seeking, once again, “Lebensraum” to the East, but he proposed one after the other win-win projects on a world scale: a “productive triangle” among Paris, Berlin and Vienna after the fall of the Berlin Wall, a “Eurasian landbridge,” together with his wife Helga, a “new silk road,” and a “world landbridge” for peace and mutual development. LaRouche, without hesitation, said “NO” and then defined another frontier. When I first became aware of his ideas, over forty years ago, three things struck me immediately. First, the fact that his concept of economics was not derived from statistics and currencies, but from the creative powers of the human mind. As in Edgar Allen Poe’s “Purloined Letter,” this fact eludes us, although its reality is blinding. As the heir of the American revolutionary tradition and as a critical reader of Marx, LaRouche revolted against the Malthusian vision of the Club of Rome, the latter sharing with financial capitalism the method of linear extrapolation of existing resources, without taking into account those that the human mind is capable of discovering. LaRouche is unique in that his initial reaction of rejection also contains the foundation of the required alternative. To criticize without proposing, he often argues, only leads to pessimism, or even worse to destructive violence. To criticize the dominant order without presenting an alternative only leads to hateful nihilism, which led to terrible ravages in the 20th Century or again today in Europe, which is becoming xenophobic and communitarianist. LaRouche’s approach is above deduction and induction; based on the unwavering determination to change the social environment to make it worthy of mankind, and to do so with what I call, in French, a universal empathy that leads him to always say aloud what he conceives. He defines himself and acts as a human being living in the future, and is inspired by those in the past, who have shown us the way out of dead ends by their capacity to discover realities beyond the egoistical sphere of sense perception—that is, by the quality of agape which distinguishes human beings from all other species known so far. The second thing which struck me in his thinking is that he understood how “liberal” ideology has by definition no directionality, and therefore allows all transgressions. LaRouche immediately understood that the moral deregulation, produced by Woodstock and May 68, would lead one decade later to financial deregulation, and to the mutually assured greed that generates crime. He also demonstrated the destructive consequences of the August 1971 decoupling of gold from the dollar, an agreement that offered the world like a chicken coop without protection to the foxes of finance, and of Margaret Thatcher’s October 27 1986 “Big Bang,” which opened the City of London to the wildest types of financial speculation by the entire world’s financial entities. Then, in 1999, LaRouche denounced the scrapping of Franklin Roosevelt’s Glass-Steagall Act, because this was not a technical measure, but rather a licence to loot given to the major financial institutions in the jungle they had created in this way, which rendered entire nations impotent to defend their people. 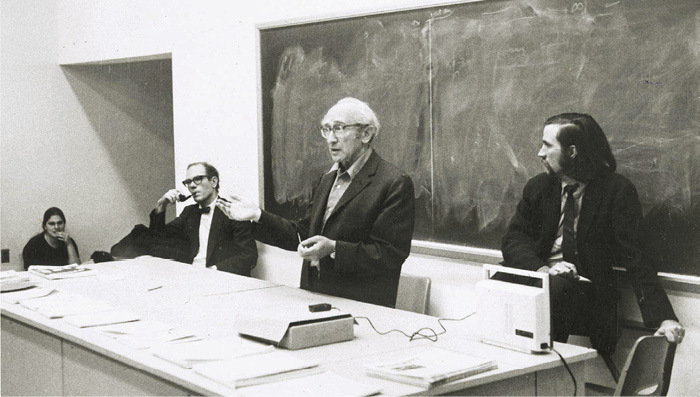 LaRouche (third from right) handily defeated leading Keynsian economist in a debate at Queens College, New York, Dec. 2, 1991. At the same time, and this is a supplementary proof of his originality, LaRouche warned that unbridled economic liberalism, akin to the sort that went rampant during the 1930s, leads to fascist takeovers, as now openly admitted in JPMorgan Chase’s report. I remember LaRouche telling us that economic liberals and financial libertarians are like drunkards: they fill themselves up with financial assets, have a hangover on the weekend and wake up as fascists on Monday morning. 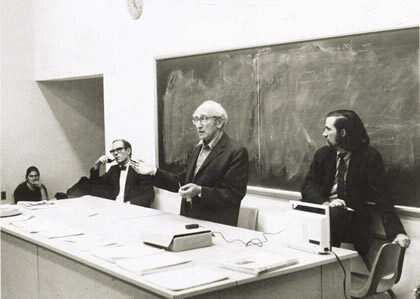 On December 2, 1971, during a debate with leading Keynesian economist Abba Lerner at Queen’s College New York, LaRouche brought Lerner to say that if the world had supported the policies of Hjalmar Schacht, “Hitler would not have been necessary.” Schacht was Hitler’s Finance Minister; he was the “financial wizard” who organized his rise to power and imposed austerity and financial manipulations, with the full backing of the City and Wall Street. In 1971, Lerner promoted this “liberal authoritarian” policy for the Brazilian military dictatorship, a policy adopted two years later by Pinochet and the Argentine generals, which led to their atrocities. Since then, since 1971, U.S. journalists have been ordered to stop mentioning LaRouche, and if ever they are obliged to do so, to slander him and pervert his message. This only comes as a surprise for those who have never consulted the United States and British press between 1930 and 1938. In 1989, after a sham political trial, recognized as a total frame-up by those who looked into the matter, including by Gaullists of the French Resistance, LaRouche was sentenced to a long prison term. When he left that prison, he was even more determined to fight. The third thing which struck me is LaRouche’s capacity to see the world as one whole, in a permanent state of becoming. As an American patriot, he always sought, “as far as in China” as the Muslims would say, what other patriots have contributed to the world, while fighting for a dialogue of cultures and civilizations. The creative capacities of human beings have their roots in the works of classical culture, “classical” in the sense that it attempts to awaken in each human being the best he or she has, to inspire his spirit of discovery, with art and science advancing at the same pace. Hence, the importance, as LaRouche stresses, of Einstein, who starts from what he calls a Gedankenexperiment, a thought experiment in the physical universe, which he nourished by his daily practice of playing the violin, in the company of Mozart and Beethoven. That same awareness is what always inspired LaRouche, who never become discouraged, even in prison, because of his personal commitment. This awareness also led him to fight Russell’s ideology, a destructive stamp our society still bears, the ideology of an Empire managing the logic of a finite world that excludes progress and demands that “the less prolific races will have to defend themselves against the more prolific by methods which are disgusting even if they are necessary.” (Russell, 1923). Consider everything LaRouche is fighting against today, from the now criminal provocations of NATO to depopulation policies. We are faced with the implacable coherence of a culture of death and we must defeat its logic if the world is to have a future. At the basis of evil, there is this conception of a finite world, created once and forever, and where the technology deployed by human beings does not serve to improve the living conditions for all, but to oppress them and, in the end, to destroy them. Thus, LaRouche’s method of physical economy should first and foremost be seen as in opposition to a universe that is “running down,” incapable of producing the necessary resources to allow a world population the conditions for a future. So-called “realists” and “reasonable people,” who follow the rules of the game of the system, in reality contribute to its collapse by the very fact that they operate within it without fighting it. Now we have arrived at a point in history where a change of system, a just concept of economy and man are necessary for the survival of all. Money has no intrinsic value; it is only an instrument and only acquires value through what it promotes. So what is the goal to be reached? LaRouche stipulates that the goal of an economic policy worthy of the name is to create the most favorable conditions possible for the development of the creative powers of individuals, in a society that fosters that: health, education, R&D, etc. The key economic criterion is not to buy cheap and sell expensive or to acquire rare goods which others do not have, but to increase what LaRouche calls the relative potential population density of society, i.e., its carrying capacity made possible by the constant introduction of new technologies applying the discoveries of new physical principles. The late Russian scientist and space expert Pobisk Kuznetsov called this fundamental criterion the “La,” La for LaRouche. Hence, physical economy, in contrast to the monetarist economy which makes money a value in itself, aims to increase this transformational power as a function of the potential physical development of society, per capita, per surface unit and per household. The idea is not to “push to the limit” a given technology at a given time, since that produces a progressive decrease of energy, but to overcome that loss by the introduction of new modes of production. That means more “free energy” compared to the amount of energy used. Both in terms of energy and technology, the challenge is to increase the energy-flux density produced per capita, per unit surface and per gram of material used. This defines, for example, the relative superiority of nuclear power over other modes of energy production, but also its inferiority, if one remains at the level of nuclear fission obtained from Pressured Water Reactors (PWRs) such as those designed by Westinghouse in the 1960s. Progress is defined by the transition to ever more productive modes of producing fission—fourth generation nuclear fission—and from there, to thermonuclear fusion. Thus, nuclear energy is not a technical method at a given moment, but a dynamic sustained and enhanced by human creation. The physical constraint that will force nuclear energy beyond the current methods is the challenge of space travel, which will require fusion power and probably, much later, matter/anti-matter reactions. Are we daydreaming? No, because these things exist in a universe which is being constantly created, and because the increasing mastery of its principles can only be based on cooperation to achieve a common aim brining together the different components of humanity. In short, that means peace through mutual economic development, not so much because of the goal to be reached, as because of the mobilization required to reach it and the quality of development of those who are part of it. Lyndon LaRouche has always insisted on the quality of cooperative work needed to implement his method, although “method” is a word I don’t like, and which in French is associated with the formal and even formalin. I prefer to speak of the “spirit of discovery,” which makes economics the most beautiful of all sciences, since it demands constant discovery. Just imagine children and adolescents rediscovering new physical principles and experimenting with them, as some of you have done. In this case, contrary to the Bertrand Russell method—and in this case it’s definitely a method, just as Descartes’ Discourse on Method is—the children do not learn and regurgitate formulas, but they discover, as little Einsteins, constructions in the physical economy. It is among these children and adolescents that physical economy, as envisioned by LaRouche, begins in service of that which is human in human beings. What is the source that will nourish this economy? For LaRouche, this cannot come from financial returns or taxes, that are based on what already exists in monetary terms, but rather on the future creation of wealth made possible by productive credit. While the Anglo-Dutch system defines itself, as we said, by the possession and the issue of money, and by the control over states by a financial oligarchy of central bankers, the “American System” of LaRouche is characterized by productive public credit, that is, by the power given to a country to issue credit for great projects aimed at increasing the potential relative population-density, and both the energy and the technology-flux density. Hence, this system of public credit defines “value” as a means to increase the productive powers of labor (again, per capita, per unit of surface area, and per unit of materials employed). We have a physical economy in the service of man, in which the physical production of tangible goods resulting from the income generated by the project itself will supply the means to pay back the debt. Money only has a value if it is linked to the issuance of credit. Therefore, it can be called an “anti-usury” system. Abraham Lincoln said, “Man is not the only animal who labors, but he is the only one who improves his workmanship.” It is on such improvement, in contrast to monetary speculation or hopes of financial profit, that the entire Hamiltonian system is based, a system expanded and further developed by Lyndon LaRouche. This approach is totally contrary to what has prevailed in the United States and Europe since the suppression of national banks and the public credit system. In the United States, it is by perverting the Constitution that the system was handed over to the megabanks and Wall Street. In Europe, it was the destructive development of the European Union which forced the nations to depend on credit from the same megabanks. The result is what we have defined at the beginning of this presentation: financial looting and a world, just as in the 1930s, headed straight toward war if nothing is done to stop it. LaRouche’s approach has been partly taken up in the agreement of the Eurasian Economic Union and the Chinese “One Belt, One Road” project of the New Silk Road, with their credit institutions, such as the BRICS New Development Bank which has recently doubled its capital and intends to sign contracts in the currencies of the member states rather than in dollars or in euros. Therein lies a hope, and not in our transatlantic world that is running into a wall. Therefore, let us leave behind the world of before, and fight for the world to come. Let us imagine teams of scientists, engineers, qualified technicians and workers, combining their skills and know-how on the scale of Eurasia and the world, and given the resources needed to use and permanently expand them. Imagine how they will spark a new spirit of co-development and win-win partnership, and Lyndon LaRouche’s method of physical economy. Imagine the United States and us Europeans rediscovering our sense of mission and our constitutional principles. Is that not what the Ode to Joy, although it has become banal, really expresses? We must take Europe back from those counterfeiters of the European Union, in order to build a real Europe of projects and fatherlands and beyond, an entente, détente and cooperation among the countries of the entire world. It is with such a project, and what it inspires, that we will find in ourselves the self-respect needed to to finish off the dominant predatory system. LaRouche’s challenge is to muster in the 21st Century all means of a physical economy devoted to mankind to build peace through mutual development, exactly those means which were mobilized for war during a 20th Century which was financially imperial and ideologically Russellite. Physical economy can become the most beautiful of all sciences since it will produce and transmit the good. It is the science of the human mind. LaRouche shows us the road to hope, which will not be made of roses but of combat. Hence, such is our conviction, man can and must become the artist of the universe by exploring domains yet unknown to us but which we can master, since the principle of creation is innate in us.